After you’ve identified a likely breakout point, you can use a resting stop-loss entry order placed just beyond the breakout level to get into a position if a break occurs. To get long for a break to the upside, you would leave a stop-loss entry order to buy at a price just above the upper level of the range or pattern. To get short for a break lower, you would leave a stop-loss entry order to sell at a price just below the lower level of the range or pattern. 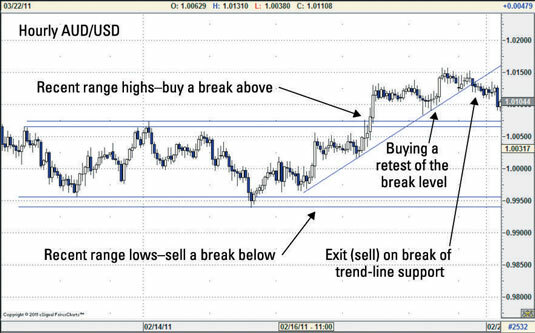 The figure is a chart showing EUR/USD and where stop-loss entry orders could be placed to trade breakouts. The appeal of using stop-loss entry orders is that you’re able to trade the breakout without any further action on your part. Breakouts can occur in the blink of an eye. Just when you thought the upper range level was going to hold and prices started to drift off, for example, they’ll come roaring back and blow right through the breakout level. Price moves like that can leave the most experienced traders caught like deer in the headlights. By the time they react, the break has already seen prices jump well beyond their desired entry level. Worse, by trying to trade at the market in a fast-moving breakout, you may miss your price and have to reenter the trade, by which time prices may have moved even farther in the direction of the break. When placing a stop-loss entry order to trade a breakout level, be aware of any major data or news events that are coming up. If your stop-loss entry order is triggered as a result of a news event, the execution rate on the order could be subject to slippage, which may reduce much of the gains from getting in on the breakout.